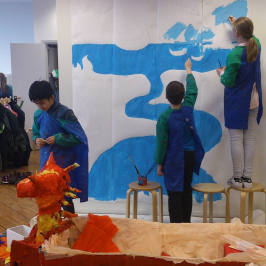 As its name suggests, Vasa International School of Stockholm, is located in the Vasastan area of central Stockholm. Our relatively low number of students –around 400 – contributes to a particularly friendly atmosphere where all are welcome. Our 25 teaching staff members and 25 ASC and other staff members come from different countries around the globe and offer an international and multicultural outlook to our students. 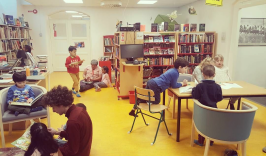 Our school offers two streams, the ​International Bilingual stream​ (50% teaching in English and 50% in Swedish, following the Swedish and the IB curriculum) and the International English stream​(100% teaching in English and following the IB curriculum only). We have 21 classes from preIB to MYP4 (Swedish grade 9) and we are a certified ​IB World School ​that offers the PYP (Primary Years Programme). As our MYP (Middle Years Programme) is relatively new, we are still in the candidate phase and we are expecting authorisation this October. The school was founded in 1998 by Mrs. Anette Parts and Mrs. Rita Ahonen, members of the school Board. ​The school does not have any particular political or religious affiliation, and is regulated by the Swedish National Agency for Education. ​The Principal of the school is Mrs. Anna-Karin Backman. While we give our students the freedom to learn and explore independently, we also believe in the importance of self-discipline and mutual respect. To ensure pupils are polite, confident and respectful young world citizens, we work constantly to create an environment where students have, and show, genuine respect for teaching staff, fellow pupils and themselves. The school has an inclusive environment where there is a high level of tolerance for individual differences. We encourage regular communication between parents and teaching staff. This is done primarily through face-to-face contact and email. Parents are also able to review what topics their children are studying with the help of SchoolSoft, (see link at the top of the landing page of this site), Google Classroom and our PYP digital portfolios. The School also runs an active mentor programme in which each pupil is assigned a member of staff whom they can approach if they have questions or concerns about their studies, and personal lives. Students are encouraged to take an active role in forming day-to-day life at the School through the Student Council. The School also holds regular parents’ meetings where parents, students and staff discuss the students’ development. Outside academic activity, we encourage students to raise funds for a variety of charitable causes. As part of the PYP 6 Exhibition and the MYP Community Project, students are also encouraged to take action in addressing issues that involve the local Community. Aside from well equipped classrooms, the school facilities include a lunchroom, gym hall, science lab, music room, visual arts room and a library. 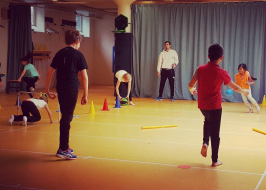 Our gym facilities are at our new sports hall on Döbelnsgatan, where we offer a full range of gymnastics and performance arts activities to our pupils. The ‘Annex’ at Upplandsgatan, near Odenplan is our two-storey venue that hosts the Music and Arts classes for PYP5 and 6, as well as MYP . At our Johannesplan site, PYP 5 and 6, and all MYP pupils, have access to the School’s design studios that offer a full range of art, woodwork and textile courses. Our aim with these courses is to promote pupils’ creative processes through working with design and form first-hand: a true celebration of human ingenuity. At the same site, we have a room for our School Health Team, i.e the school counsellor and the school doctor. The preIB (pre-school) class with students of ages 5-6 is also located at Johannesplan. Our librarian, Patrick Durkan, is on site to help students with research and finding books appropriate to their interests and reading levels. The books from the school library are for school use. Regular visits to the city library are also made during the term. We consider our library a ‘hub of inquiry’ where students can conduct research and collect information for their lessons and other projects.